Enter the world of business websites where standing out from the crowd requires a little bit of creative thinking, and patience in the process of finalizing the design of your digital enterprise. The appearance of your business website will go a long way to position yourself as trustworthy, and reliable business that takes into consideration trending trust signals that users are on the lookout for. With a professional look on your business website you won't have to worry about users getting the wrong first impression, but the road to being seen as a professional outlet requires some effort to be put into the design aspects of your new homepage. You should strive to comply with the bare minimum of requirements for a functional business website, those are -- the definition of your company and its vision, concise way for customers to contact you (email, phone number, physical business address), and a clear explanation of what kind of products and services you provide. Despite the simplicity of these tasks, many business owners overlook the basics that customers seek when they open a new website for the first time. So to help you, and your friends, to setup the optimal design outline every time you plan to launch a new business-related website, follow along these essential tips for how to design a business website that will easily stand out not because you spent thousands of dollars to come up with a creative design idea, but because you took the necessary time to implement trending design standards that define a professional business website. Trying to create a website without having a goal in mind is like marrying someone without knowing why, there has to be a main reason for anything that you plan to do with your website, not only because it helps to eliminate unnecessary clutter, but because it helps to create a solid outline for how your users will interpret the content of your website. Airbnb effortlessly explains the purpose of the product whilst providing an easy to use form to begin using the product right away. If you want your users to signup for your services, your homepage should outline the required steps to do so, on top of explaining in-detail what your services are about. Once your goals have been written down, there's no need to waste time in thinking into the process too much, and it's time to take action. Design assets include things like deciding on a platform that you're going to use for your website (WordPress is a solid choice! ), coming up with a plan for logo design, and deciding on any other brand assets that would help to promote the image of the brand; business cards, flyers, digital imagery for social media promotion. Gary Robinson, who runs an affordable logo design services, Logoglo, had this to say about choosing a logo service that's affordable but still manages to provide quality: "There are thousands of companies out there that provide low cost logo design services, but the majority of them provide low quality logo's that are often re-used templates. But, if you take your time and have a look around, you will find somes gems, my company prides itself on high quality workmanship, whilst maintaining the costs to a minimum." Nevertheless, for your first business website you shouldn't be shelling out tens of thousands of dollars for a pristine design, a combination of affordable WordPress themes and utilization of services as provided by Gary, can ensure that your website will cost a minimum amount of investment, whilst still standing out from a saturated crowd of poorly designed websites. There's no greater loss than having to lose a customer because of a poorly written copy of what your services, or products, are meant to do for the customer. Latest trends in web design show that one of the best ways to help potential customers understand a product is through customer reviews and testimonials. 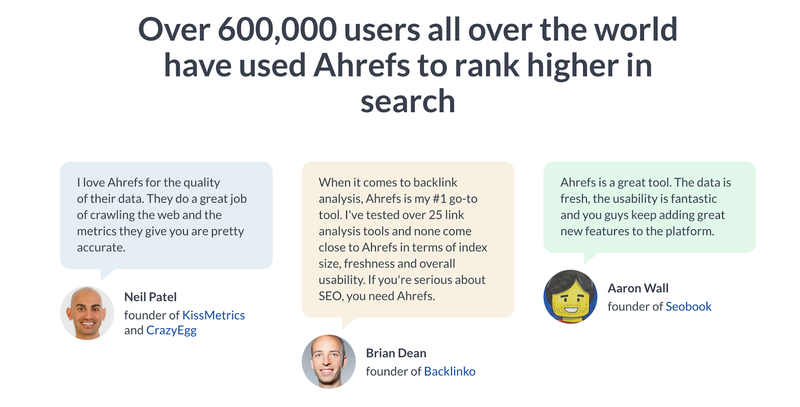 When potential customers are reading reviews of other people who've signed for your services, they can better understand if your services can do exactly what they're looking for. 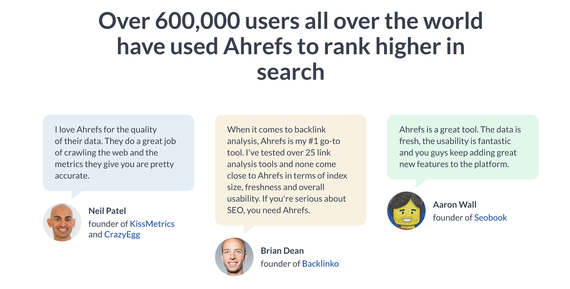 Ahrefs, a popular marketing tool for SEO, uses this concept to showcase testimonials from industry-famous experts, which helps to add another layer of trust for the quality of your services. Video testimonials, or at least your own in-house built video explanations of the product, can turn out to be an immense boost for strengthening your brand as someone who's willing to go out of the way to connect with customers and their pain points in an emphatic way. Not only can business tools help you better test the performance of your design, they're invaluable assets for moving forward with your website in the field of keyword research, competition analysis, and general customer analysis to help you understand where to look for customers and how to best meet their needs. If you're starting out just now, considering going through any of my previously published columns about tools that make business optimization a breeze. Start with going through the list of small business tools that will get you up to speed with the latest trends in marketing, then start to shift your focus towards social media oriented tools to establish a strong brand message on the most popular social media networks, and finally look into startups tools that are relevant to business growth in its initial phases.